Tom had mentioned always wanting a boxer, so I began our search. 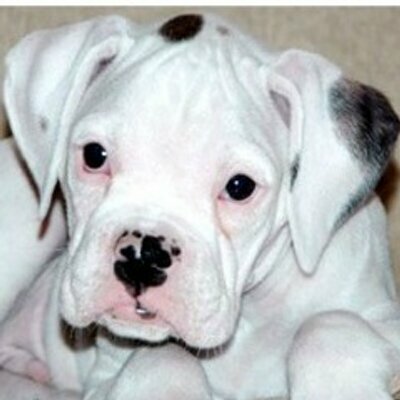 I noticed a vet article regarding white boxers and how they are not uncommon, like I thought, but rather they are undesirable because they are not recognised by the AKC because of their color (this may be different now, this is just what I read in 2006). I found a white boxer puppy in need of a home. He happened to be born to a breeder who bred dogs for show and stud quality, Enzo did not fit the bill. So I made the drive 3.5 hrs, one way, on Dec 11, 2006 to bring home the pup that would forever change our lives. Prior to picking him up I was informed by the vet that he had to talk the breeder into giving her “white boy” a chance before euthanizing him. What?!? This makes no since to me. From the moment I met Enzo I knew there was something extra-ordinary about him. Everyone who met him felt the same way. He lived with us for 5 1/2 yr on this earth, now will forever live in his legacy. Fast forward, Dec 2010 Enzo had his first surgery to remove 5 quarter size mass cell tumors off his leg. At that time they rated them 1-2 and prognosis was good. For one year we thought we were in the clear, until December 2011 red spots appeared all over his body, they were grade 3 mass cell tumors. We realized soon they had spread throughout his body. We opted again to have the larger ones removed and went to specialists to see what we could do to slow their growth. Only to find that they began spreading so rapidly we would see new ones weekly, not to mention what was going on inside our boys body. He went to acupuncture, and went on a special diet with supplements. We didn’t want him to suffer. The doctors gave him 9-12 months. In March everyone came together for my birthday but also to say “good bye” to Enzo. You see we all have choices in our lives that no one wants to make, sometimes YOU are the only one who can make the decision. I knew Enzo’s last day would be desided by me, his best friend, his caretaker, his mom. He put on a brave face during most days, but at night he cryed, paced and barly slept. I was lost! I didn’t know how to help my boy, my soul ached for him. After trying everything I could think of I went to see an intuitive reader. Ginger, told me simply to listen and he would let me know. Sunday April 22 he was up all night. Monday we went along with our normal morning routine, except one thing, I had Tom call a special vet who would make house calls. We walked our final loop around Rose City Golf Corse. It was so sunny and calm, I knew I couldn’t let my boy suffer just because I couldn’t let him go. We got back to our house and sat on the deck in the sun, all my animals gathered as if to say “good bye”. Soon it was time. In the end, he laid his head on my lap, looked up and our eyes locked and without words we knew it was time. Silently we shared our gratitude for the love we gave each other, the experiences we embarked on, and the lifelong memories I’ll have. Monday, April 23, 2012 at 11:08 am I felt the warmth go out of my friend and I knew he would never be in pain again. At that moment, I wished my heart would stop! Just long enough for me to catch my breath. This day is a blur but I remember each and every moment as it were yesterday. Enzo was that one animal that comes along in your life that changes everything. He wasn’t the “best” anything, he was just simply the ONE. I share my experience with all of you so you understand Enzo and the legacy he leaves. When I say I understand your pain, I really do.